The current flow meter design states that once a PVC-Lock or Sharkbite connecter is attached it cannot be removed. How about extending the plastic pipes coming out of the flow meter so the connectors CAN be removed. 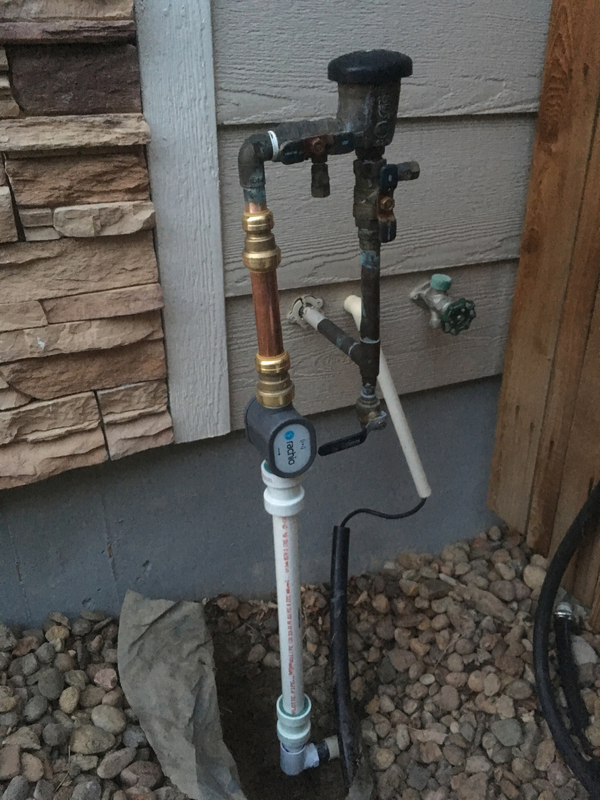 In my application, I cannot move the pipe on either side of where the flow meter is to be installed. 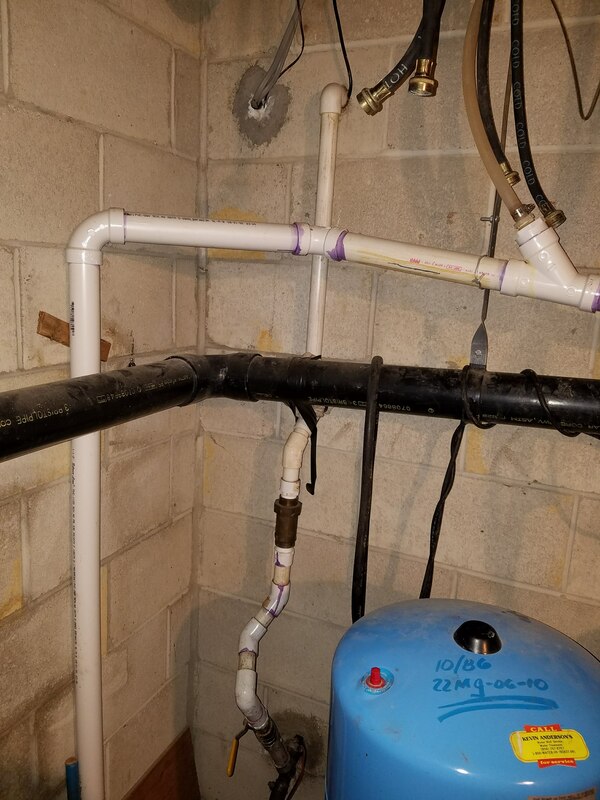 If it was possible to disconnect a Sharkbite from one side then I could use a 1" Slip Sharkbite connector that could slide up the pipe allowing the flow meter to be installed without moving anything. Then if need be, it could be removed. Without that extension to the flow meter pipe there would be no way to remove the flow meter since the slip connector would not be able to slide up the pipe if it can’t be disconnected from the meter first. About 1/2" extension to the flow meter stubs would have eliminated this problem!!! Yes, I sure wish there was a way to disconnect the PVC-Lock connector from the flow meter. I spent about 5 hours trying to install the flow meter in a fairly constrained space and already had to cut off and destroy one of the PVC-Lock connectors to get it off. I need to do it again to get another one off, but left it for another day. it looks super easy when it’s a few spare PVC pipes sitting on a desk, but 100% of the time I run into some physical barrier that makes it much more complicated or even impossible. I understand that extending the 1" stubs would make the whole installation longer, but the installer could always cut them to fit. I eventually just gave up on the installation and routed some new PVC piping to get the water back on in my house. Maybe I’ll try again later now that I’ve learned from some of the pitfalls. I think I found a solution for my installation. PVC-Lock makes a slide connector like Sharkbite’s. Just takes one extra connector and a little more room and I can make an installation I can take apart if needed and I can install without having to move any pipes, etc. Yeah, I bought one of those thinking it would solve my problem, but it’s pretty long and I don’t have enough space to install it. I realized that in hour 1 of what ended up being a 5 hour aborted project. How about extending the plastic pipes coming out of the flow meter so the connectors CAN be removed. @rbakerpc, thanks for the feedback! This would require a mold change, but would be helpful. PVC-Lock makes a slide connector like Sharkbite’s. Are you referring to this fitting? If so, it needs to be installed fully extended, otherwise the pressure from the water will push it out to the full extension and might rearrange your piping. I run into some physical barrier that makes it much more complicated or even impossible. @rccoleman, I’d love to see photos of the tight space you’re working with. Would an underground installation be easier? Yes, that was the fitting I was referring to. I do not have enough room to install it fully extended but I don’t think it could move the pipes before or after. I have my own well, the well line comes into the basement near the floor and there is a T-adapter right inside the wall. From there, a line runs up the wall with a shut off valve followed by a backflow prefenter with a bunch of fittings in between. Finally there’s a straight piece of 1" PVC that runs up the wall for 22 inches before making a 90 degree turn going out the wall to the blow out adapter and then going under ground to the zone valves. So I only have a 22" section of pipe to install the flow meter in with the water flow going UP. I cannot move the pipes below or above to get enough room to install the flow meter. The instructions say not to glue anything to the flow meter otherwise I would have glued unions before and after to make the install relatively easy. Right now I’m at a loss as to how to install the flow meter so it can be removed if needed. I do not have enough room to install it fully extended but I don’t think it could move the pipes before or after. The instructions say not to glue anything to the flow meter otherwise I would have glued unions before and after to make the install relatively easy. I believe the underground installation instructions will work for your use case as unions are required to the limited pipe movement underground. We hope to have them finalized by the weekend. I’ll post here once available. That would be appreciated. I was planning on calling tomorrow to try and get some suggestions. 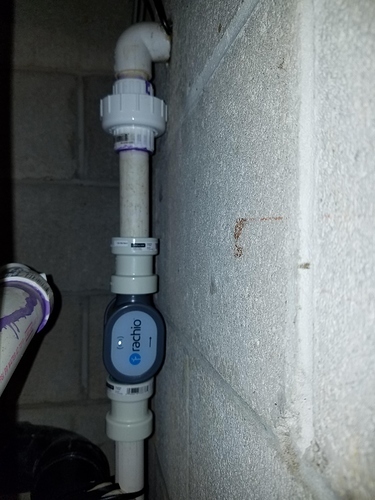 I’m just really afraid of trying to put much pressure on the line coming up from the well to try and get enough room for the flow meter in the line with PVC-Lock connectors. I really don’t want to mess with that at all. If anything happens to that line then the whole house is without water. The sprinkler installer has the line wrapped to the drain line as it goes up the wall to keep it rigid. The other PVC line cross overhead is the sump pump line going outside with our water conditioner drain line tapped into that line. My original idea was to just put a union above and below the flow meter and then I wouldn’t have to move anything plus it would be removable if needed. 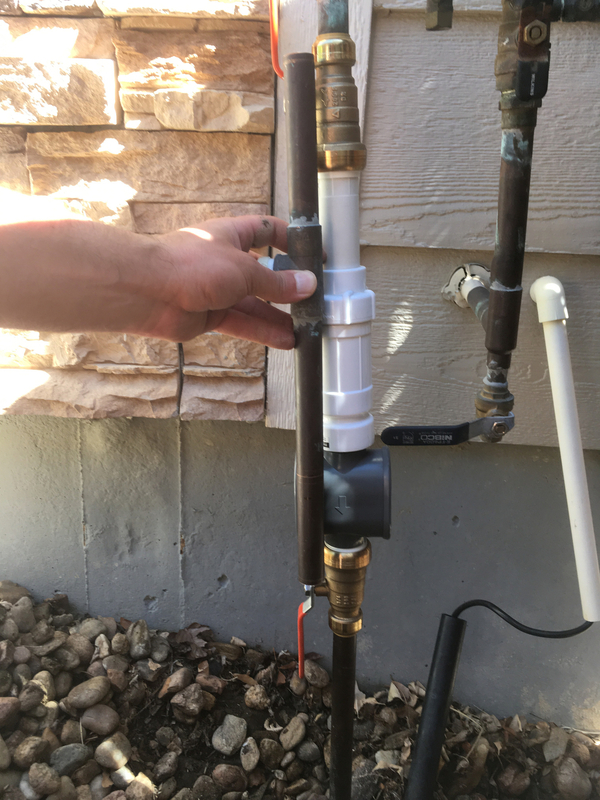 How about this… What if I used PVC-Lock couplings in both ends of the flow meter, then say a 3 inch piece of 1 inch PVC pipe with that glued to a union and the other end of the union glued to my existing pipes. That way I wouldn’t be gluing anything to the flow meter and I’d have my unions on either side to allow getting the meter in and out. I think I have enough room to do that. After talking with support yesterday I was able to go ahead and made a successful install of my flow meter today. I wound up only needing one union to get enough room so it worked out pretty well. I centered the flow meter in the 22 inch straight pipe I had after the back-flow restrictor. That way I have at least 6 inches of straight pipe before and after the flow meter with PVC-Lock connectors at each end of the meter. I made the glue connections on either side of the union BEFORE connecting anything to the flow meter to avoid damage. No leaks and everything is working great. @rbakerpc, you beat me to posting the underground instructions! Here they are for reference [link] – we’re recommending a different union setup to avoid the need for glue. That way I have at least 6 inches of straight pipe before and after the flow meter with PVC-Lock connectors at each end of the meter. I made the glue connections on either side of the union BEFORE connecting anything to the flow meter to avoid damage. No leaks and everything is working great. Just checked and I wouldn’t have been able to get those PVC-Lock connectors to replace the union locally. Our Home Depot doesn’t carry them in the store. At least I’m up and running. I just made sure to glue everything BEFORE connecting to the flow meter with the PVC-Lock connectors. When explained my idea to tech support before I started they agreed that my setup would work just fine. Our Home Depot doesn’t carry them in the store. @rbakerpc, bummer! That seems to be an issue other users are also experiencing. I bet we’re causing Home Depot to rethink their fitting orders! I just made sure to glue everything BEFORE connecting to the flow meter with the PVC-Lock connectors. We appreciate you taking the time to do this. It’s easy to rush into the installation and order the wrong parts. I’m curious, what do you think we can do to help highlight this better on the packaging or unboxing experience? One other thing, Lowes doesn’t carry the PVC-Lock adapters at all whole Home Depot only carries certain adapters and not the whole line. It wouldn’t hurt to make extra clear not to glue and WHY, or how to glue what you need prior to installing the flow meter with PVC-Locks like I did. There are probably going to be certain applications where it’s just unavoidable. The other thing that could be a little confusing is that all examples and diagrams show a downward flow through the flow meter. In my case, my meter is in the upward flow since my well water supply comes into the basement BELOW the sprinkler controls.